The Nissan Titan gets two noteworthy additions and a host of detail improvements for 2008, delivering more of the truck capability while taking off just enough of the tough-guy truck image to appeal to a broader range of drivers and occupants. New long-bed models have been added, and are longer than most competitors, along with more bed space, payload, and fuel capacity. Inside, the 2008 Nissan Titan sports a thoroughly redesigned interior that is at once more attractive and user-friendly. There's plenty of room for a growing family of five or four big sportsmen off for weekend recreation. Titans range from utilitarian models with crank windows to leather-lined cabs befitting a luxurious sport-utility. Titan's proven and powerful V8 and automatic is the only choice, and it's a stout engine raced at more than twice its street-legal 317 horsepower. Nothing like this gets good gas mileage and if you have no plans to haul stuff around or tow anything, the Titan will be overkill and you should check out a van, or maybe a Pathfinder for those Nissan faithful in need of four-wheel drive. When you do haul and tow, you'll find the features added for such activities very useful and that it's surprisingly capable for a half-ton pickup. The 2008 Nissan Titan line has been expanded to include the new long-wheelbase model. More than 25 variants are available. Choose from two cabs (King, Crew), two wheelbases (short or long bed), two- and four-wheel drive, and four trim levels (XE, SE, Pro-4X, LE) in virtually any combination with these exceptions: Pro-4X models are 4WD only, and the King Cab Pro-4X is short wheelbase only. Four-wheel drive adds about $3000; a long wheelbase adds about $400, and figure $2500-$3000 to move up from King Cab to Crew Cab. The base XE model is focused on function and includes cloth seating for six, active front head restraints, full instrumentation, cruise control, and on Crew Cabs, power windows and door locks. Popular SE models add alloy wheels, upholstery upgrades, a CD changer, heated power mirrors, and conveniences such as remote keyless entry and illuminated visor mirrors. The next slot, sort of a 4WD only SE derivative, is the Pro-4X model with larger, more aggressive tires, off-road suspension tuning, two-tone cloth upholstery, and double sun visors. Luxury characterizes the LE model, which runs 20-inch wheels, fog lamps, leather power seats, a 350-watt Rockford Fosgate sound system, dual-zone climate control, power adjustable pedals, and chrome power folding heated mirrors. All except the XE offer a front side/side curtain/roll-sensing stability control option package. SE and Pro-4X have the widest choices, from spray-in bedliner to seat choices, while navigation is reserved for Pro-4X and LE trucks. On Crew Cab SE-or-better only, a moonroof and DVD entertainment are among the options. The 2008 Nissan Titan's most notable change is the new long-wheelbase variant that provides a bed length of almost 8 feet, 3 inches on King Cabs and 7 feet, 3 inches on Crew Cabs, the biggest box on a half-ton crew cab pickup; those models also have the largest fuel tank at 37 gallons. Subtle changes to the grille, lamps, bumpers and wheels have softened the edges a bit but Titan's in-your-face attitude is still prevalent. The high level of function remains too, and maximum payload has been lifted above 2,000 pounds on certain versions. A tow package (up to 9500 pounds) that includes extendable dual-element mirrors and transmission temperature gauge ranks among the best in half-ton pickups, the locking tailgate is damped and assisted for easy open and close, and available features like the cargo track retention system (bed sides and floor) and storage box in the rear fender ideal for wet tow straps or chains are unmatched in class. The 2008 Nissan Titan cabin will still serve well for truck duty, but it is now more refined and has less edginess, eliminating one of the few gripes regarding the original Titan. Dash and door panels are easy-to-wipe-off plastic yet no longer give the impression of cost-cutting in materials, and the new instrument layout provides all the same, complete information but has a more coherent sophisticated look to it. On Pro-4X models the gauges are white-faced, and LE models have enough wood-like acreage to fit in a luxury utility. Titans can be equipped with a six-person bench seat interior or with captain's chairs in front for a five-seat capacity. Our Pro-4X had the buckets with heat, power adjustments, and two-position driver memory system to complement the adjustable pedals. The only nuisance in fit is the tilt-and-telescoping steering column adjustment that is spring-loaded and requires you to tilt-and-telescope the wheel with one hand while the other holds the release. You sit high and comfortable, not squeezed but not loosely floating about and visibility is excellent to all corners (and well-behind with the tow mirrors) although some shorter drivers may not like the large base on the windshield pillar. An optional rear-view camera is available and we found it eased trailer hitching. A new center dash section for 2008 handles audio, climate, navigation, and switching duty (tow mode, VDC off, diff lock, etc.) with a slightly more integrated look. It looks better than last year's setup and more easily handles extras like the dual-zone climate control on LE models. All controls are logical and sensibly arranged, although traditional pickup truck buyers who go for six seats will have to adapt to wipers and shifter on the same side of the wheel. With deep bins in the center console and smaller ones along the sides, big door and seatback pockets, and generous cup holders, you'll find a place to put virtually anything. Entry and exit is simple, aided by running boards if you value deportment above ground clearance. Rear doors on King Cabs swing almost 170 degrees for easy access and there's room back there for six-footers on short-to-moderate length trips. Crew Cab rear seats are downright spacious and eclipsed only by the Dodge Ram Mega Cab and Toyota Tundra CrewMax, neither of which offers near the bed capacity of a long-bed Titan. Titan Crew Cabs offer an optional moonroof and DVD rear-seat entertainment system. You won't see any of the noise-reduction materials inside (unless you're under the dash installing a brake controller with the tow-package pigtail) but if you've ever been in a Titan you will notice the 2008 is much quieter and smoother. 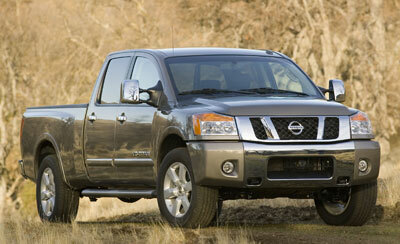 The Nissan Titan was widely recognized for its stout drivetrain, and it's been slightly uprated for 2008. It comes standard with the big V8 and a five-speed automatic transmission. Although it doesn't have as much horsepower as GM's larger V8 choices or Dodge's Hemi, it matches or betters most on torque and a Titan will outrun most pickups and deliver competitive mileage to similar configurations; only the Tundra's 5.7-liter/six-speed automatic combination really betters it. The exhaust has been retuned to keep the V8 rumble so adored by truck buyers while eliminating the drone that could wear on long highway trips. On paper, the fuel economy has dropped for 2008, but in reality it's the same as before; the EPA has changed its test procedures, which yields results much closer to the fuel economy most drivers will obtain. A proper gated floor shift allows direct access to any gear without pressing any buttons, and the transmission responds smoothly and crisply as conditions dictate; a comfortable grip and good location adjacent the driver's leg encourages one to use it. Four-wheel drive and low-range are electrically shifted by a rotary dash knob. The electric locking rear differential (Pro-4X only) is more effective in severe terrain than the all-wheel electronic traction control of regular 4×4 Titans and most competitors. There is no automatic 4WD setting for on-road use, but if the electronic traction aids aren't enough perhaps you should be in 4WD high-range. The rear axle has also been strengthened considerably to accommodate the towing and new load ratings. Pickup trucks aren't held in high regard for ride comfort or handling prowess yet they have made strides in both. The longer wheelbase only betters cruising comfort but even the short-wheelbase Titans will generate no complaints, at least not from anyone that knows what a ton of payload means. Off-road biased suspension tuning with lots of travel, shocks built specifically for it, and large tires on the Pro-4X contribute to ride softness without giving up control, while the 20-inch wheel/tire combo on LE models offers crisper turn-in but transmits bumps more. The 2008 Titan also receives more powerful front brakes with larger rotors and all the plumbing changes that go with them: In spec-speak they are not quite as large in diameter as a Tundra's but they have greater swept area, a better indicator of braking capacity. The Titan has always performed well in pickup brake tests, and these offer a larger margin of safety and durability, needed because the previous brakes didn't hold up well. The 2008 Nissan Titan adds long bed models to the mix and more refinement, but continues the stuff we liked about the previous version. Titan boasts a robust powertrain with responsive acceleration. For 2008, it gets improved braking and a redesigned, higher-quality interior. Head/hip/leg room, f: 41.0/61.3/41.8 in. Head/hip/leg room, r: 40.4/60.5/40.4 in.